One of the secrets to turning the act of preaching into an art is to learn to prepare to preach powerful sermons. 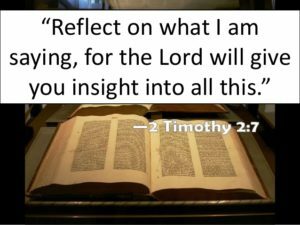 In this post we begin a series on how to go about putting together a sermon. There are many styles of good preparation. I remember hearing a nationally-known American preacher answer a question to put him in a conference about how he went about preparing his messages. His response was, “I won’t answer that, because I’m not a good example.” Yet, his way of preparing to preach worked for him. So, in this next series of posts, I will not be prescribing a process so much as talking about some basic elements of preparation. 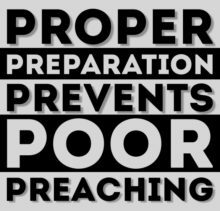 Today’s post is a little technical, but stick with me as we explore this topic together: Prepare to Preach! The basic place to begin your preparation is the Word. We are preachers of the Word, the Scriptures, the Bible. But there are a couple of different ways to approach the Bible in your preparation. Here are some basic definitions that will help you prepare to preach quality sermons. You can read a fuller explanation of these definitions in this link. To interpret a text by way of a thorough analysis of its content. Exegesis is what comes out of the Bible, as against what gets read into it. Exegesis is using certain methods of studying the Bible. Here are the main methods that are used in exegeting a section of the Bible. In summary, then, exegesis means figuring out what a Bible passage meant to the first readers, and then applying that truth to today’s setting. Prepare to preach as you learn and apply what the Bible’s message to life. Eisegesis is the interpretation of a text (as of the Bible) by reading into it one’s own ideas. In other words, instead of beginning with the Bible, the person who is using eisegesis begins with an idea, and then turns to the Bible to find proof texts that support his idea. We’ll explore how to do this well in a later post. Here is a sample process to prepare to preach as you exegete a passage of Scripture. Start with prayer. Ask God for a revelation of what the passage means to people in general, and what it means for you, as well as what it means for the people to whom you will preach. Read the passage, meditate on it, find out what other people have said about this passage in commentaries. I’ve found it helpful just to put the passage into my search engine. That almost always produces commentaries and sermons that will let me know what this passage meant to the original hearers. Observe the world around you, and reflect on what this passage means for the people to whom you will be preaching. Keep up, in other words, with the news of the community in which you are going to preach. Most preachers find it helpful to outline the passage’s main points. Others just begin to write out phrases and illustrations of the main points, to be organized later. Go over the message until it becomes part of you. Here’s a video of Nicole Smithee, preacher and author of preaching. She shares how she goes about preparing an exegetical sermon.